The State Emergency Service (SES) and Rural Fire Service (RFS) volunteers provide an important public service in times of disaster and in the aftermath of crisis. One of the biggest considerations of the services is timeliness. The effectiveness of disaster relief strategies directly correlates with how quickly the services are able to mobilise their volunteers. Critical communication is what Esendex leads the market in. As Australia’s leading business SMS service provider, with direct connections to the major networks, Esendex boasts delivery rates that are unmatched within the industry. On average 99.5% of SMS are delivered in less than 20 seconds, and 99% in under 5 seconds. This means that the SES and RFS can rely on Esendex to deliver important updates and know they will reach their destination quickly. 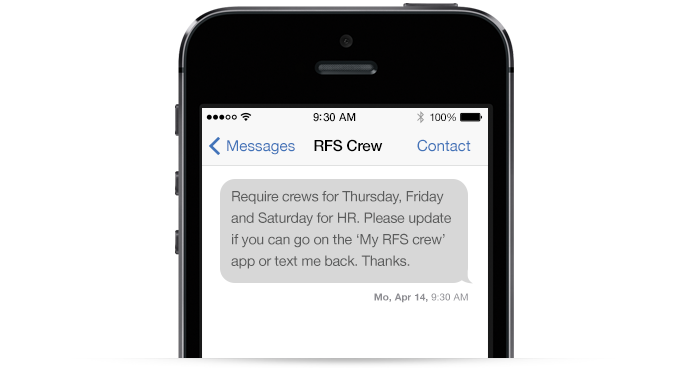 Effective communication about rostering and deployment is vital to the functionality of the SES and RFS, and is something the services rely on SMS for. SES volunteer and creator of rostering communication tool, Gerard, said that the SMS services have been extremely useful in determining volunteer availability. “Brigades use SMS to call upon members in emergency and normal operational situations. It is the primary means of prompting members to indicate their availability in the short-term where other means of communication carry too much lag,” he said. Before Esendex’s SMS solution, phone calls and pagers were used to “opt-in” when volunteers were available in times of natural disaster or emergency situations. This was time-consuming and did not always result in reaching potential volunteers. 98% of SMS are read, and on average it only takes 90 seconds to respond to them. The high reading and response rate of SMS has made the processes of rostering and creating an emergency strategy quicker. "It reduces cost as we can target only those members we wish to contact for a variety of situations. This ability to target specific members by their ability and qualifications, combined with a competitive cost per message dramatically reduces overall operational costs." Gerard is one of many that have enjoyed the convenience that SMS services have provided for organisational purposes. “It provides a way to continue to send SMS, but in a highly integrated manner with our Member Availability and Resource Management Systems. It reduces cost as we can target only those members we wish to contact for a variety of situations. This ability to target specific members by their ability and qualifications, combined with a competitive cost per message dramatically reduces overall operational costs for Brigades,” he said. Esendex’s delivery rates, direct connections and experience in dealing with large-scale operations make us the only choice for SMS needs. Call us today on 1300 764 946 or email us at sales@esendex.com.au.